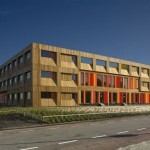 The University of Twente, located in the city of Enschede in The Netherlands, has a new building with 87 apartments for students. The building is nine stories high, and features a climbing wall on one side. The building was designed by Arons and Gelauff Architects. The high rise at the Campagneplein location lies in the middle of the Residential and Social Centre on the Boulevard facilities street. 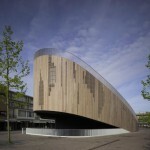 The project stands between the Bastille by Piet Blom and the Herman Haan sport centre. Just like the Calslaan project, this building is also on a former parking lot. The building is nine stories high on the sport fields’ side. 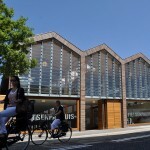 On the Boulevard side, the building fits the small-scale character of this pedestrian street with two building layers. The supermarket and the hairdresser are on this side. On the first floor, the dwellings are situated round a communal roof terrace. 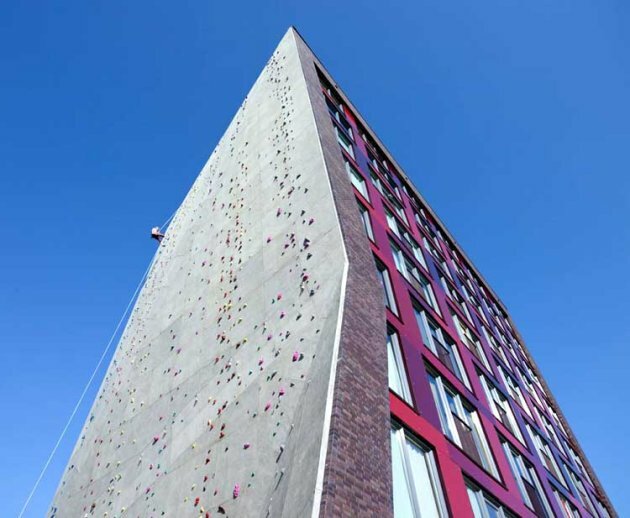 The façade facing the sport centre is fitted out as a climbing wall. 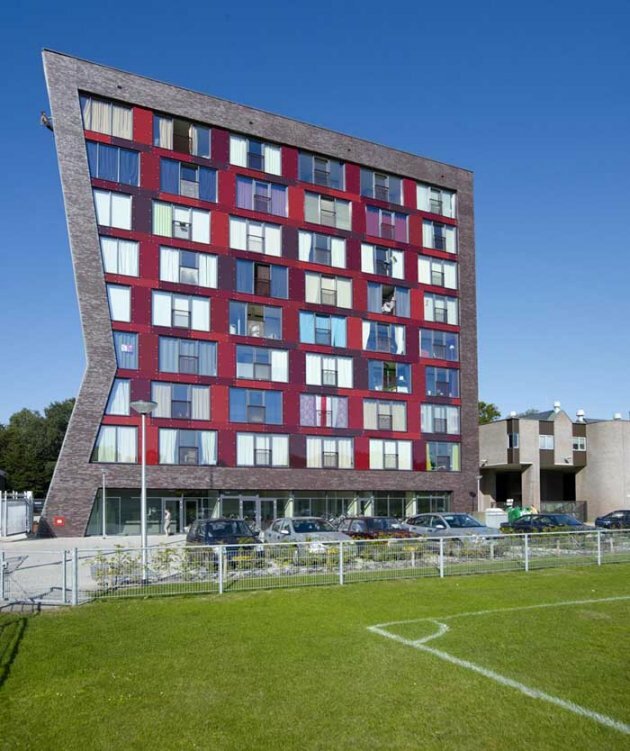 These two student dormitories – a courtyard building in the forest and a highrise with a climbing wall – are located on the campus of Enschede university in the east of the Netherlands. Thanks to a functional mix of housing, study and leisure and the arrangement of the buildings as solitaires in the landscape, the university compound from the 1950ies is one of the few real campuses in the Netherlands. According to a new masterplan, the dorms were originally meant to be built next to a new straight aisle through the forest. In order to avoid this interference with the landscape, we looked for alternative sites and found two more or less abandoned parking lots in strategic locations. The highrise at Campagneplein also stands on a former parking lot and borders on a sports field in the south. The sports theme has been literally integrated into the architecture, in the form of a 30 metre high climbing wall. In this case, the floor plans as well as the building envelope were already determined by the client. From these starting points, we generated a 9-storey building next to the sports field, connecting to a 1-storey building housing a supermarket and some commercial spaces. On the north side, there’s an additional row of student studios on top of the low building, whose roof serves as a collective garden. 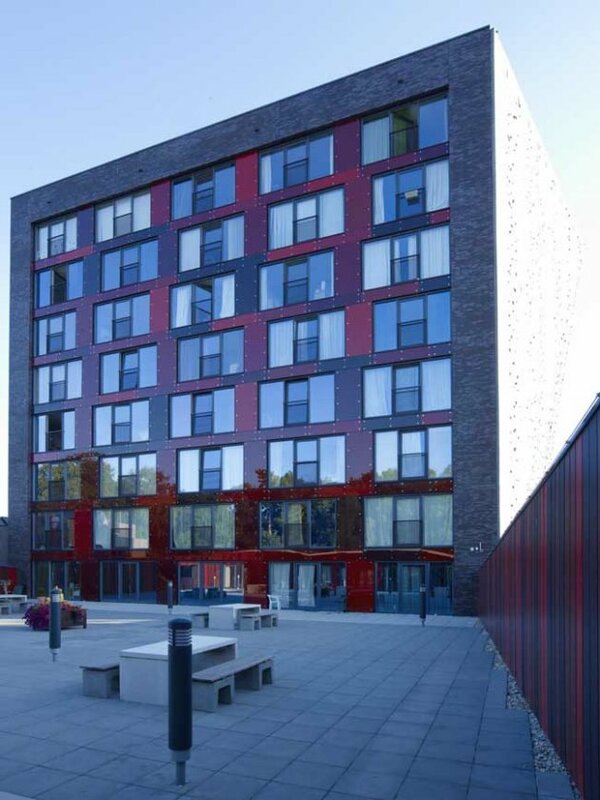 The façade materials are the same as for the courtyard building in the forest: juicy red glass panels and dark brick. 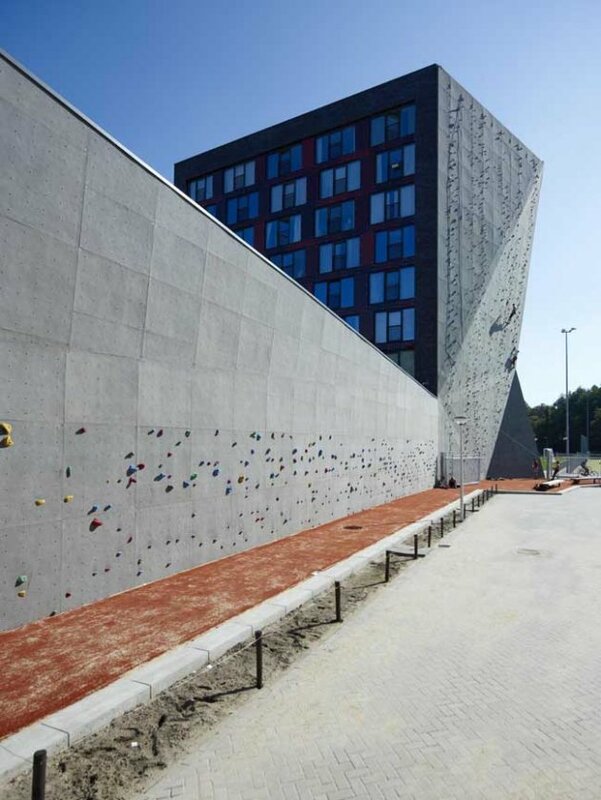 The climbing wall with 2500 grips is the second highest in the Netherlands and forms the eyecatcher of the otherwise rather straight-forward building. It was a gift from the client to the inhabitants of the campus, because the university of Enschede has a very active and successful mountaineering club – however paradoxical that may sound in the flat Netherlands. As a climber in the Netherlands, one anyway has to resort to artificially created training spots, so why not combine architecture and climbing wall? The folds of the wall look like the urban abstraction of a mountain and give the building a sculptural appearance. Seen from the sports field, it seems to be bending its hip. The brick frame around the glass panel façade emphasizes this impression and creates a logo-like shape. The western wall of the low-rise building is also covered in grips and can be used for „bouldering“. 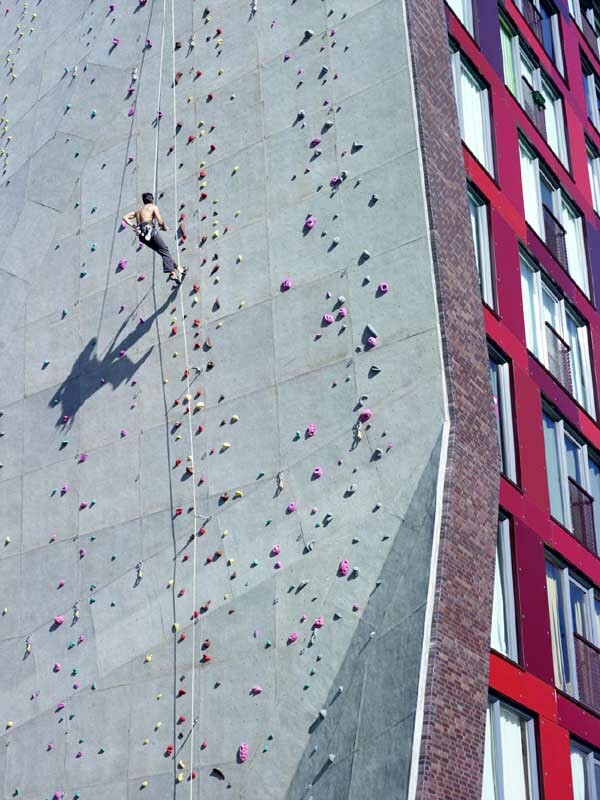 The climbing wall instills a fun factor into the building and therefore forms a contrast to the chique red glass façade. As motive for a sculptural deformation, it also gives the highrise character and recognizability. 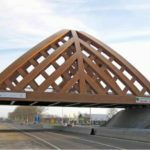 Visit the Arons and Gelauff Architects website – here.